The most obvious feature of the Aissawa gathering I have just described is its gender-specific nature. Women, effectively (if not always officially) excluded from full participation in worship alongside men at the mosque, had formed a religious community which included many practices and beliefs which varied from orthodox interpretations of Islam. The emphasis upon maraboutic saints as spiritual intermediaries goes against official religious doctrine, and men I knew frequently dismissed such practices as superstitious and ignorant behaviour. This inevitably begged the question of why these rituals were not banned or more actively discouraged by Islamic authorities, as they so very clearly went against received teaching. I knew the imam of a small neighbourhood mosque, whose own sister played the bendir for the Aissawa, with at least his tacit approval. I gathered from questioning him, and from similar conversations with other men, that although maraboutic practices were not considered correct forms of worship for male Muslims, they were nevertheless acceptable for women, as well as some socially marginal men. The reasons I was given for this were often uncertain and sometimes contradictory, quite probably because sharp distinctions between male and female social practices in most other fields were so ubiquitous and appeared so 'natural' that such bifurcation did not demand serious analysis (9). In some respects, then, women were allowed to pursue these practices, despite their heterodoxy, because they provided a mostly harmless, quasi-religious, recreational activity at which the supervision of the female hierarchy of the neighbourhood was maintained (10). For women, apart from the often rather vague religious reasons for gathering (not one, for example, suggested to me that attending the Aissawa was a requirement of their faith), the institution doubtless provided a forum which acknowledged their genuine concerns and offered a remedy which was both immediate and tangible. As each saint was associated with a particular affliction, it was also possible for the audience to tell, by noting who danced to which songs, the otherwise unspoken grievances and ailments of their neighbours. Most dancers eventually swooned away into the arms of friends, who stroked their brows, loosened their clothing, and cosseted them back to full consciousness. Dancers themselves 'could not control' their response to the music, and usually claimed not to remember it having taken place. I have no reason to doubt that this was absolutely true, though of course, this did also absolve them of any accusation of self-pity or self-indulgence which might otherwise have been levelled at them. To this extent, the Aissawa could be considered to function as a communal support group, where psychological distresses could be safely discharged within a supportive, understanding community. It is significant that most women who frequented these gatherings tended to come from the poorer quarters in the city. They were frequently illiterate, often had less freedom of movement than better-educated neighbours, and their life prospects were more dependent upon their making a fortuitous, lasting marriage. If a wife was divorced from her husband, a fairly common occurrence, she very often returned to her parental family, hoping for any kind of re-marriage that would provide for her and any children she had. In such circumstances, where women were very much at the mercy of forces beyond their control, it was reasonable to turn to magical explanations and solutions to their intractable problems. In expressing their frustrations in such a way, however, women also manifested stereotypical gender characteristics which partly validated their unequal political role in society. 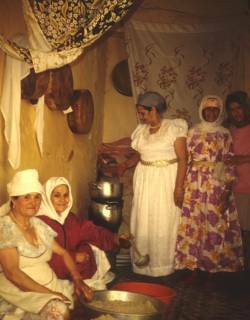 It was widely held, in a range of popular discourses in Morocco, that the 'female nature' was essentially different from that of men. Whilst masculine tropes were associated with the public sphere, self-control and logic, the essence of femininity was correspondingly depicted as irrational, superstitious and overwhelmingly emotional. Inevitably, such generalisations were fraught with contradictory evidence and viewpoints but nevertheless were considered credible enough to sustain a multitude of polarising social practices. One heard locally that in 'modern' cities like Casablanca and Rabat, or over the border in Waharan, women smoked cigarettes, drank beer and drove cars, but in Oujda such license was still considered quite shocking. As women were not considered capable of restraining their passions they, and their community, needed to be protected by restricting their access to intoxicants and freedom of movement. Indulging in these practices thereby constituted a masculine act and those women who openly engaged in them were likened with prostitutes. This was possibly because an association was made between inhabiting other theoretically male attributes and the assumption of the active sexual role, though such labels also served to distance the moral from the immoral female communities. For Oujdis, such blatant contravention of gender boundaries provoked both fascination and revulsion, but in any case brought about a break with one's community for the woman in question. Prostitution, professional cabaret dancing and singing, or other morally disreputable trades, could not easily be carried on within the quarter, or even the town, where a woman grew up, for fear of reprisals from family and neighbours. Even if, for some poorer and less-educated women, such activities did offer genuine financial independence, its price was the loss of the all-encompassing support the female community afforded its members. Rather than taking this path, many more marginalised women took refuge in institutions like the Aissawa, which in many ways offered some respite from the frustration and anxiety of everyday existence (11).